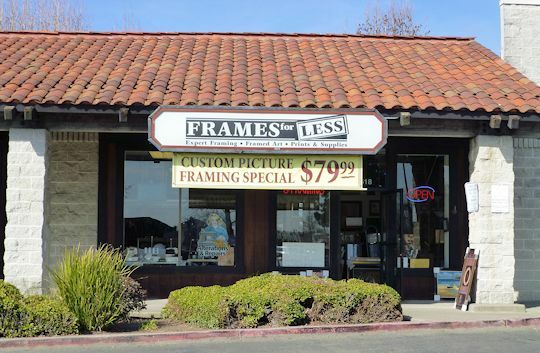 Frames for Less is a locally owned and operated full service picture framing store in Napa, Ca. We provide high quality framing, personalized customer service, and a variety of affordable framing options. We have a large selection of moulding to choose from, both special order and in-stock. Our knowledgeable and friendly sales associates have many years of framing experience and will guide you through the process. Whether you are framing a piece of original art, family photos, prints, or memorabilia we can help you choose a great frame and the right materials for the job. From moulding selection, glass type, matting, and mounting decisions we will help you to design the best frame for your needs. If your project is short on time, bring it to us. We have a large selection of in stock material and can turn projects around quickly! © 2006-2013 Frames for Less.